So we've seen what we can do inside the house to make a difference on the environment, see my previous blog post "Going Green inside your home." Now let's see what we can do on the outside. If you have kids or a green thumb, some of these are going to be a lot of fun. 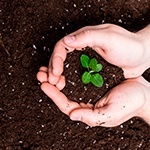 Composting is one of the easiest and greenest ways to help out the environment. A compost bin doesn't cost too much, or you could even build your own, but even then they're not necessary when a nice heap will do fine. 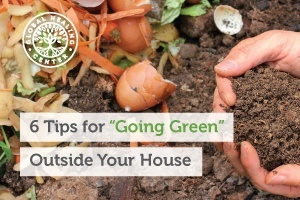 Pretty much anything will go into a compost pile, from your lawn clippings to raked up leaves to last night's dinner. If you like to drink coffee, add your used coffee grounds to your compost pile to increase its overall nitrogen balance. 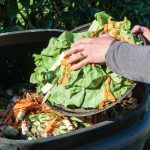 Not only does composting keep your garbage scraps out of the everyday waste, but it also creates a great food for your garden. Wait for your compost to degrade, and then you have some seriously healthy dirt to start planting your new veggie garden. A lot of the stuff you can do outside is going to have a green thumb about it. If you have a compost pile, you should also have a veggie garden – the circle of nature is just beautiful. Imagine growing your own food, right outside your kitchen window, and never forgetting those last minute herbs or vegetables you need for dinner. And when all is said and done, all of your scraps go out into the compost bin, to one day help grow more vegetables. Starting a garden isn't just something for those with a huge backyard either. Anyone can grow their own vegetables, whether you have a backyard or not. Container gardening is a great way to grow vegetables if you don't have enough yard space. Everything from tomatoes to lettuce to peppers and herbs, all right out in the small courtyard in front of the kitchen. Composting may not be a lot of fun, and neither may planting your tomatoes or weeding the garden, but worms are always a big hit, especially with your children. You can buy yourself a small bin of dirt filled with worms, till your garden, add the worms, and after awhile you get more worms. Check with your local gardening store to see if they have worms for sale. This way you're getting nice healthy dirt without the use of chemical fertilizers. When your compost is ready, add to the dirt to create more nutrition for your plants. 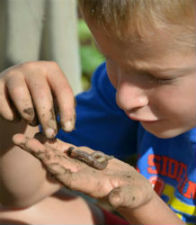 Gardening Tip – You can always tell healthy dirt if there are worms living in it. There are so many ways to save water outside that I just had to mention it. The Australian's, who are doing all they can to save water, use everything from buckets in the shower to massive tanks out back. This is normally a more expensive option than the buckets, and can range anywhere from $75 up to several thousand. But installing a water tank that can catch rainwater – most normally harvested from your roof and guttering – is a great way to help the environment. From the tank, you can connect up a hose and water your garden whenever you want, especially handy if your region is affected by drought and, subsequently, water restrictions. 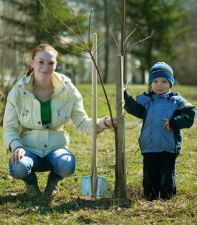 Across many nations, there are regular events to plant a tree. With the mass of deforestation taking place, every tree replaced is an improvement. If you've got the room, make sure that you ask someone about the type of tree you wish to plant (so that the tree doesn't send roots into your house), and plant a tree outside. I recommend planting trees that will produce fruit and grow well in your area. 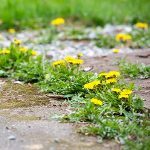 I view going green as an activity for the whole family, and another one of the family-oriented ideas has to do with your lawn. 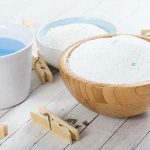 If you are a parent with young kids, then you're going to love having them playing outside – preferably where their noise is muffled by a window. And by choosing the right type of lawn for them to roll around on, you can save the environment some harm. Once again, looking for local advice is going to be your best bet. Head to your local nursery and ask for the type of lawn/grass that grows well in your location and requires minimal watering. Often these are going to be native grasses, but there are also some special grasses designed to thrive with very little water. These of course do well in drought-stricken regions, but are also going to be useful in cutting down on the watering you'll need to do. You might want to have your kids checked for any possible allergies to different grasses before planting. Also be sure not to use chemical-based weed killers or fertilizers. Another thing you can do for your lawn and the environment is to use a reel mower. Sure, it's going to take a bit of extra work on your part, but it is satisfying work. And when you're done mowing – hopefully with the help of your kids – you'll be able to throw the clippings into your compost bin without any of the contaminants picked up going through a petrol powered mower (you can also use an electric mower if your back isn't up for the reel mower). Those are just some quick and easy tips to help you go green outside your house. They are helpful to you in that they help you save money, they save the environment some extra work, and they are infinitely rewarding. There is nothing quite like growing your own food outside. And once again I'll stress the importance of getting your kids in on all of this. The earlier they learn that being green is a good idea, the sooner they'll make it a part of their lives. What are your tips for going green outside? Leave them in the comments below.